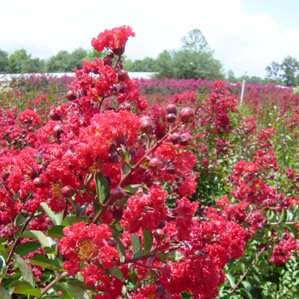 A Carl Whitcomb introduction Red Rocket® Crapemyrtle has huge, up to 20 inches long, cherry red flower clusters. Flowering begins in July and will continue until frost. New growth is a red to red-purple color and new wood is red in color, the leaves will fade to dark green later in the season. Lagerstroemia indica ‘Whit IV’ has an upright growth habit and can get up to 20 feet tall at maturity. This cultivar is highly resistant to powdery mildew and has some drought tolerance. For more information on this product and other Whitcomb introductions go to www.lacebarkinc.com.